Did you hear that? That was me heaving a heavy sigh of amazement at the genius of Perludi. 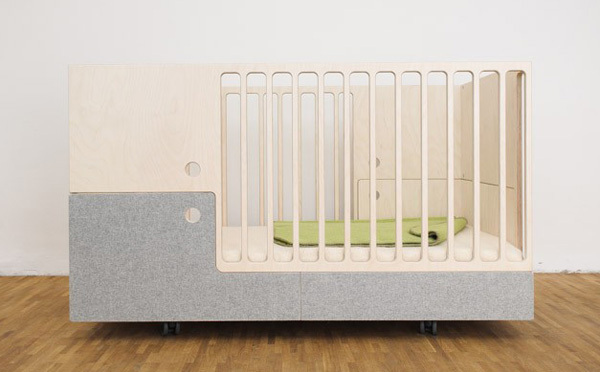 Multifunctional furniture at its finest, click through to see all that this cot can do! More than just a cot, the Otto in the Moon cot (pictured above) morphs into a gorgeously modern junior bed (pictured below) suitable for children aged up to around eight years, depending on their height) and then transforms again into a sublime ottoman (see bottom image), becoming perfect for an older child’s bedroom or play space . I love it and wish it would magically appear in my youngest son’s bedroom! The clean, modern design is simple, as always. Perludi execute the minimalist straight lines beautifully with pieces made using birch wood, adding texture with a fine Austrian Loden wool veneer. The Otto in the Moon design piece is available in three colours – grey, orange and sand. 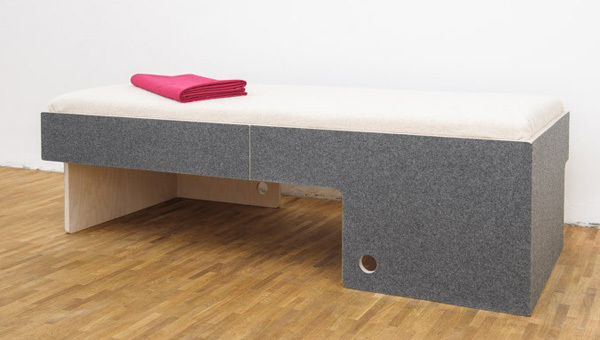 This multifunctional piece does have a high end price tag of €950, but considering you don’t have to worry about a bed for eight years, it’s quite likely worth every cent! For more images and details on Otto in the Moon, head on over to Perludi.